When you choose Adlington Hall for your wedding, you get a unique luxury wedding venue situated in the beautiful East Cheshire countryside, in the North West of England and you can rest assured that we’ll do everything we can to make your day perfect. We pride ourselves on making sure that you get the best quality, personal service from your first enquiry right through to the time your final guests depart. Every wedding at Adlington Hall is a very special occasion to us. Our reputation for excellent customer service and impeccable organisational skills means we’re the ideal choice for your civil ceremony and/or reception. You’ll find our dedicated team are committed to ensuring your wedding day is as magical and romantic as you always dreamt it would be. We have a great team of wedding coordinators, who’ll start thinking about your special day from the moment we meet the bride and groom. You will be provided with a team of experienced wedding coordinators who will be responsible for every little detail of your wedding day. On hand at all times before your wedding, until after you are married, they’ll guide and advise you through every decision. For your special day, we have a variety of areas licensed for both weddings and civil ceremonies; two stunningly beautiful, indoor venues, as well as two breath-taking outdoor areas (for use from April to September) to take your vows, meaning we can offer you the best of both experiences. Our magnificent Great Hall and welcoming Hunting Lodge, both indoor, offer something uniquely different. Outdoor areas include; the historic walled Courtyard of Adlington Hall and the quintessentially English Rose Garden, with a variety of colours, the gardens have something to give throughout the year. All fully exclusive and each with their own special uniqueness, whichever area you choose you can guarantee your guests feel just as special as you, as they watch you say your vows. The Great Hall of Adlington Hall has the true ‘Wow factor’, with intricate murals surrounding all the walls and overlooked by the famous, one of a kind 17th century organ. 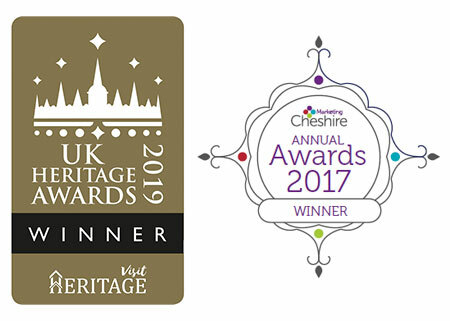 You and your guests are guaranteed to feel you are really enjoying part of English heritage and history. Your reception can be held in The Hunting Lodge. Again, fully exclusive this versatile venue (recently beautifully refurbished) lends itself well to a wide variety of style and décor. With stunning open brick walls and high wooden beamed ceilings, you have to see the room to truly appreciate its beauty. As we are set in acres of beautiful East Cheshire Parkland, for couples that are wanting to celebrate with a larger number of guests, there are different areas within our grounds perfectly suited to place a marquee. The Great Hall and adjacent gardens can also be booked for a stylish drinks reception before your celebrations begin, even if you choose to get married elsewhere. Our attention to detail emanates through our quality service, beautiful grounds and with the outstanding food from Barretts Event Caterers make us the ideal luxury venue to get married at, in East Cheshire and the North West of England. Read About Adlington Hall on Hitched. Hold your wedding ceremony or drinks reception here with us, and your story becomes part of ours. The Hunting Lodge is a beautiful Georgian mews building and can seat up to 140 people. For those wishing to marry outdoors, Adlington Hall Gardens offer two exclusive settings.